Go big or go boho — or both! Create your favorite space with vibrant colors and intricate patterns that speak to your soul. 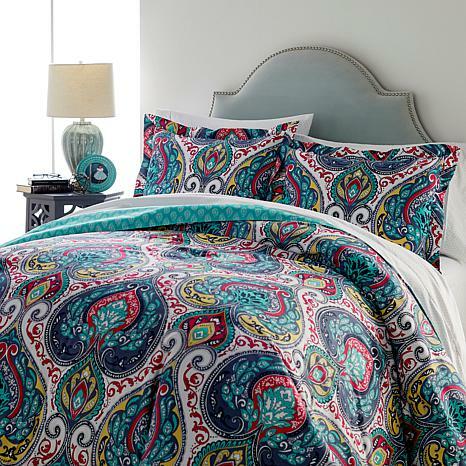 The large-scale print of this comforter set engages your room in a vivid way, and for the days when you want a more subtle print, flip it over to the peaceful mint green paisley pattern. Gain two different bedroom looks for yourself, and sleep la vie boheme. I PUT THIS IN MY GUEST ROOM, THE COLS WERE PERFECT. I WASHED IT FOR THE FIRST TIME A IT FELL APART. This is really junk along with other one's. who ever made this did a very bad job. The material cotten in the middle of the comforter only sewed 4 corners that left the whold center of it to fall apart when you wash it. you can fix this with a real simple fix. it needs to be sewn APX every 12 inch's that will keep it all together when you wash it. This comforter is super cute but I have had it for 2 weeks and the stuffing in already falling down to the bottom and I cant get it straightened out. I cant imagine what would happen if I washed it. Would be great for a guest bed that didnt get daily use.